Girls can play football too! Two brothers go head to head at Pee Wee football when the star football player brother doesn’t include the nerdy brother’s daughter into his team. You see the girl is one of the best players who tried out, but he didn’t want her because she is well, a girl. I thought I never watched this before. I just saw it this morning. When I watched the intimidation scene with white foamy drool escaped from their mouths, I definitely saw this before. That was the only scene I remember clearly. I never knew Devon Sawa is in this. From there you can tell he would grow up into a handsome guy. He did, but now . . . he’s losing his looks. But he looks great here. Maybe he should lose some weight. Anyway, this children’s flick was a lot of fun. 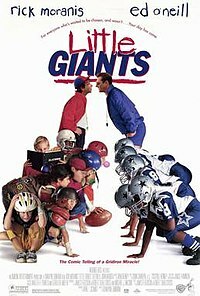 The main character Becky O’Shea is really good at football and makes her dad couch a team going against her uncle’s. When Junior Floyd joins the team, she gets gaga for him and decides she should be a cheerleader instead of a football player. Junior don’t do for tough tomboys. The storyline is simular to Mighty Ducks. A crap team tries to beat the best team there is. But in this one they grab any kid anywhere to join the team. They don’t even have to like football. I had a lot of fun watching this. Watch out for the giant BABY! Thank you to Yahoo Answers, otherwise I would never had watched the movie. I saw this when I was like five or something and I always remembered this image a baby getting zapped in his pram. It was the only thing I could remember– I eventually thought it was just a dream because I couldn’t find out if such a film exist. I typed in ‘giant baby’, ‘baby giant’, ‘baby movies of the 90s’, and other stuff. Films with babies/toddlers were kind of popular in the 90s weren’t they? There was Baby’s Day Out, Baby Geniuses . . . any others? I even read a teen’s novel about a girl and a stranger being zapped into babies. That book was hilarious, I wish I remembered the title. 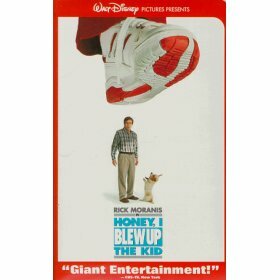 This is the sequel to ‘Honey I Shrunk the Kids!’ That movie was awful and disgusting. Wayne Szalinski is a scientist of a large company and the team are trying to make things bigger. When they tried out the machine, instead of growing it explodes in their faces. His wife, Diane must take their daughter Amy to college. So Wayne takes the toddler, Adam and his son Nick (who is love with Kerri Russel’s character Mandy) to the laboratory to try out the machine himself. He has to sneak in because his boss thinks he is a nuisance and a waste of time even though he did create the shrinking machine. Using Adam’s stuffed bunny as the test subject for his enlarging machine. He found a way that might actually work but no one would give him the time of the day to listen to his suggestions. Adam comes and grabs his stuffed bunny while they weren’t looking and he and the stuffed bunny get zapped! Adam runs back so when his brother and father turn around, they don’t suspect a thing. Everything is the same size so they think that it didn’t work. When Adam comes near anything electrical, he feeds on it and grows. He becomes larger in Wayne’s van because it’s solar powered. Wayne and Nick find out the machine did work when Adam grows taller than his own father! How do they do this? It looks so real. I thought the technology back in the 90s sucked. Miss Popular aka Mandy turns to the Szalinski’s house to baby-sit Adam. She’s very serious about the baby-sitting business (maybe she should join the baby-sitter’s club) and forces herself in. Of course she faints when she sees Adam. Diane returns and is shocked herself and the whole house is filled with chaos. The nosy neighbours know something’s up, but they can’t candle an adult sized baby better than these guys can. Since the world is surrounded by electricity, Adam continues to grow and turns into a giant sized baby, walking through Los Angeles. How phat is that? I wish there’s a giant baby walking through my town right now. Tear jerker moment: When Adam cries for getting shot by Wayne’s mean scientist. Either the producers pinched or hurt him in some way to make him cry, or this kid is a really good actor. Funniest moment: When Adam is dressed up as an adult as Wayne and Nick bring him back into the lab, and when the family are chasing Adam around the house. Hilarious stuff. I can’t rate this movie because I’m bias when it comes to stuff like this.